Ever wondered how we “wash” our salt? We invest in our equipment, like this salt washing machine. This machine removes all impurities like dust and excess minerals which allows us to supply cleaner, higher quality salt to our factories where the salt will be refined even more. 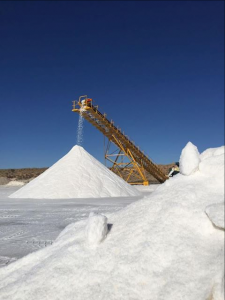 There is a common belief that through the table salt production process the salt is bleached to improve the whiteness of the salt. This is not true as we do not add any chemicals to the salt except Potassium Iodine which we need to add by law. Potassium Iodine was first added to salt in the mid-1920s to combat an epidemic of hyperthyroidism, an enlargement of the thyroid gland caused by hormonal irregularities due to lack of iodine. This is still the case today.